It's no surprise to hear that Leopard smokes on the latest Intel box, right? That's all fine and dandy for new Mac owners but what about the rest of us (the majority) who are still pumping that legacy PowerPC architecture beneath Cupertino's OS? 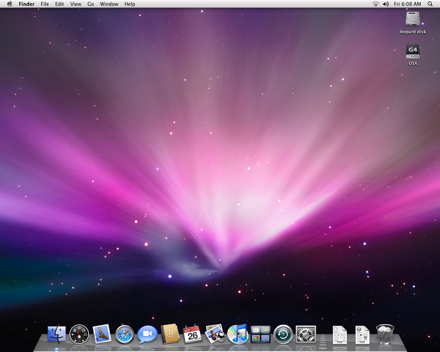 How does Apple's OS of tomorrow run on say, an 8 year old Power Mac G4 (AGP Graphics)? We decided to find out. Our test machine sports a paltry 512MB and 1GHz clock courtesy of an after-market CPU upgrade (was 400MHz) -- just a tad better than the 867MHz / 512MB minimum requirement. While the box held up surprisingly well, there's one major problem which you old-timers should be aware of. Oops, that's not the appropriate resolution for our screen, Apple. Nevertheless, everything we need is front and center. 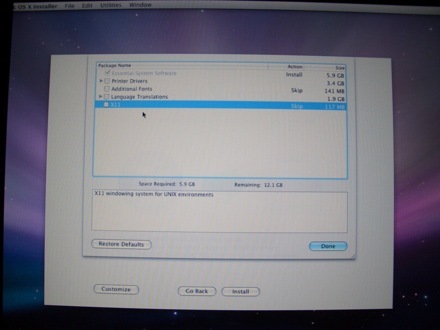 With our 20GB disk formatted down to a paltry 19GB, we braced for a clean install. There's always that secondary disk sporting Tiger... just in case. Of course, the first thing we did was to pare back the installation from 11.4GB to 5.9GB by deselecting the Printer Drivers, Additional Fonts, Language Translations, and X11 support from the default install. We can always add them later, dig? 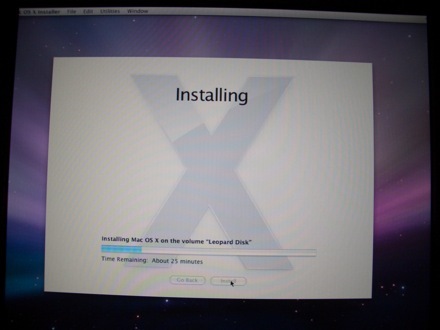 The initial estimate of 32 minutes actually took only 20 minutes to install -- no upgrade here folks, just a clean OS. Peppy, and much faster than we had anticipated. We were up and dancing on the desktop and on our WiFi network in another 8 minutes after answering a few setup and configuration questions. With a whopping 12.78GB left over, we're ready to start testing apps. If you've already been using Tiger on your G4 then you won't notice any performance difference -- it's still pretty snappy. Granted, you won't get Stevenote-like cached performance but it's certainly acceptable for casual use. Time Machine -- Oh it backed up the data ok which is the important bit we guess. However, you can't get to it using their nifty time traveling interface. Not that we expected to. 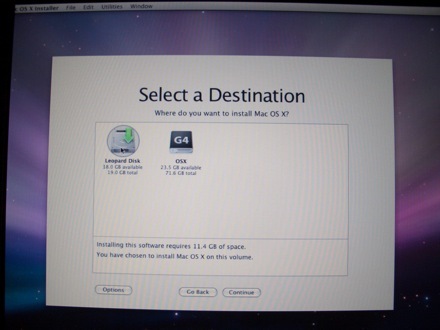 Launching the Time Machine app sends our G4 into a black hole of despair. After bringing up a few random finder windows our Power Mac inevitably manages to escape from the other side after about a minute of machine-locking terror. DVD Player -- Unexpectedly bad news here folks. No matter what we did, even swapping out our after-market Pioneer DVR-104 for the original Matshita PD-2 LF-D110 DVD-ROM drive, Apple's player crashes with that error above. No Disney for you kids! VLC 0.8.6c -- Ok, it's not an official part of the OS but with Apple's DVD Player giving up the ghost we had to do something. Sadly, VLC is dropping about 25% of the frames making the viewing experience, well, awful. Thing is, this version works just fine in Tiger. We're hoping (really hoping!) for an updated release soon. Front Row -- What, you don't expect miracles do you? The application loaded, we could hear it, but the screen was black making it worthless. So what's the bottom line? We wish it were as simple as a one sentence summary. 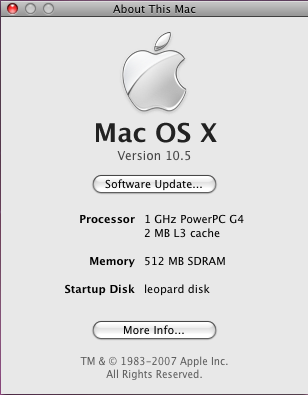 We'd like to recommend a G4 running Leopard as your kid's computer. After all, this version finally brings some useful Parental Controls onto the scene to lock down, monitor, and more importantly, simplify the interface for your youngsters. You can even monitor their use without having to fire up Apple's Remote Desktop or some janky VNC application -- it's all baked in and automatically setup. Even the parental controls can be remotely managed without ever having to enter the scorched plastic hellscape of your toddlers room. However, without the ability to playback movies, you're missing out on the whole electronic-babysitter angle. 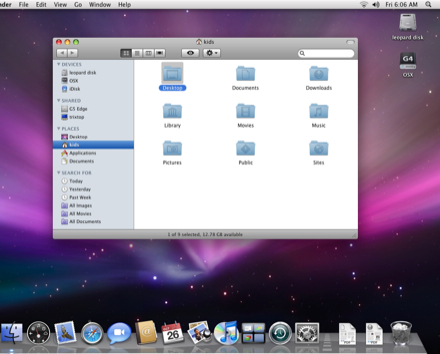 That's why we're leaving ours in dual-boot Leopard / Tiger mode for now. You just never know when 90 minutes of silence might be required.